SG unveiled its new web site at an assembly meeting last night. The web site will include a blog for current council members, profile pages with “about me” sections, and links to message individual members. According to SG President Renard Miller, the goal of the new website is to create an active space for interaction between SG and students. SG was motivated to create the web site because the old web site was rarely updated and difficult to navigate. Miller said people often approached him to ask how to access readily available SG services, such as funding. A calendar of SG meetings, all of which are open to students, as well as SG’s Twitter feed, will be featured on the home page. 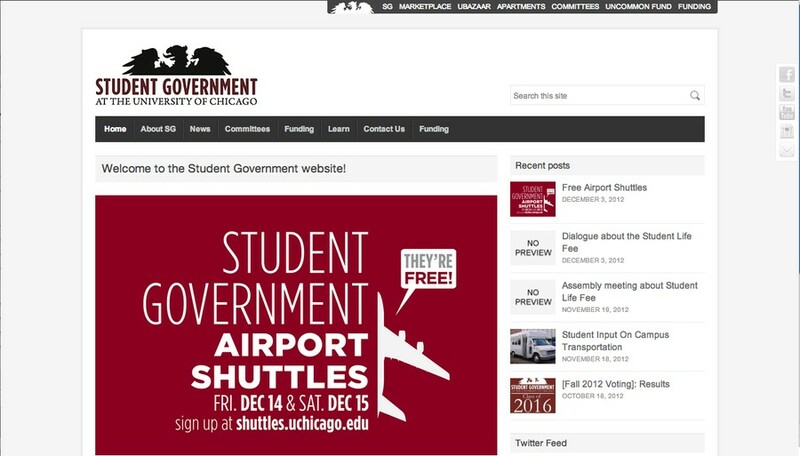 The web site will be linked to sg.uchicago.edu by Monday. Until then, the web site can be previewed at 128.135.87.223.